"At one with nature" is the motto of the International Orienteering Federation and in the ninth edition of the World MTB Orienteering Championships this could not be ignored. The organizing committee put a strong effort on environmental issues; among the various actions, organizers decided to reduce the environmental impact by using biodegradable and compostable tableware, in order to avoid plastics. The choice fell on the EcozemaTM eco-friendly disposable tableware. A LOCAL PARTNER. 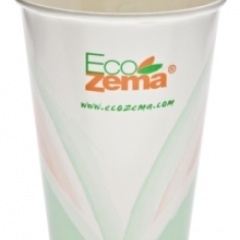 EcozemaTM is a range of biodegradable and compostable foodservice ware. All products are made from raw material coming from different kind of renewable sources, such as corn starch and sugarcane. Ready to use, high hygienic, EcozemaTM products can be trash with food waste in compostable bin, since it is fully biodegradable and compostable according to EN13432 or ASTM6400. Ecozema®, Zema®, ReZema® e GardenZema® brands are a property of Fabbrica Pinze Schio Srl, established at the beginning of 1900 and headquartered in Santorso, Vicenza. For further information visit www.zemaonline.com.